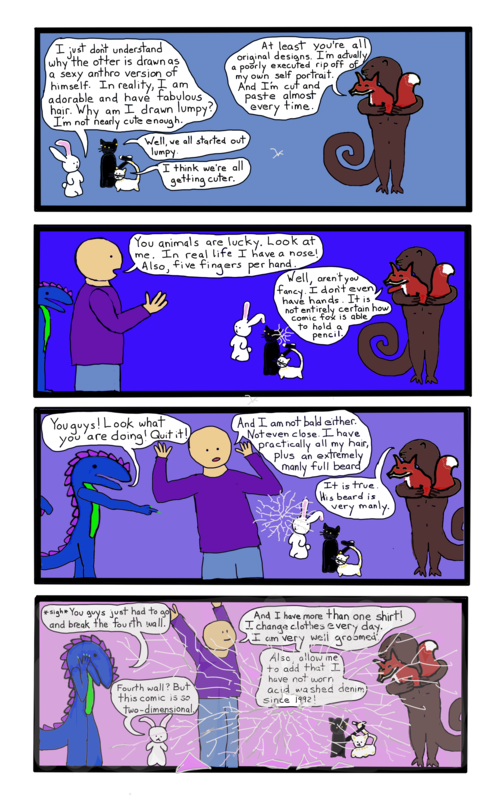 If we’re using the Andy Kaufman metric, this comic is a complete success because it amuses me. The danger of time travel is not that you might become your own grandpa. It’s that you might have to clean up your own mess. We’re just taking our meta experiment as far as it can go. 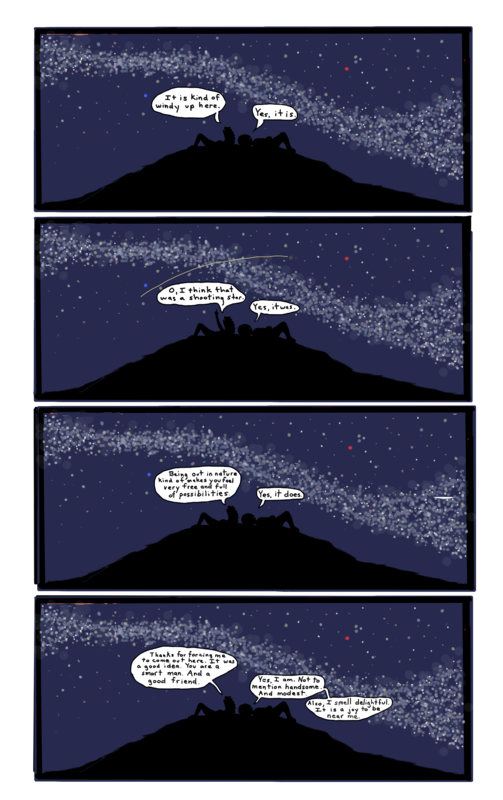 The 4-panel layout has some particular limitations in terms of what you can do horizontally and vertically, but it also allows for this perfect setup mocking the passage of time. Personally, I find time travel to be primarily comedic. I’ve never seen a time travel story that actually made sense, and while I was a big fan of Quantum Leap in its time, a lot of what was going on there was more fantasy than science fiction. There’s an X-Files episode that covers time travel as well, but the storyline has a guy from the future returning to the past to kill the people responsible for discovering time travel, because the knowledge of how to conquer time has made the world a horrible place. Generally speaking, though, time travel stories are ridiculous. Looper, for instance. If you can send people back in time, wouldn’t it made more sense to just send them farther back? Instead of sending back assassins and paying them in precious metal and then forcing them to assassinate themselves and run the risk of them balking at that task, why not just send your targets directly to the Jurassic era and let them be eaten by dinosaurs for free? I know people loved that movie, but I found it completely nonsensical. If I were a criminal and going to break the time travel law anyway, I can think of a million better things to do in the past than kill people. As for the comic, originally the gag was just going to be that Dragon goes to all this trouble to see the future, only to learn that the future holds no surprises: Dragon will be drawing. But I think having the kids in there adds another dimension: Dragon realizes that jumping ahead to the future means that certain things have been left undone in the interim, and then we get a final zinger when the girl references traveling back in time. I also like some of the poses I’ve gotten the different characters into. In reality, The Man cannot kneel like that, on account of a sudden and unplanned high-velocity meeting of his knee with a guardrail, which resulted in the metal volume of his patella being somewhat higher than that of a normal human. The rabbit really would wrap her ears around her eyes, if she could, to unsee anxiety producing activity. In panel 2, I guess the fox is jumping off the otter’s back to whack the remains of the shattered 4th wall with the broom. That is what is happening. And I also like the way the otter’s tail wraps around the panel frame for balance. And I’m glad the animals in panel 3 have taken it upon themselves to clean up the mess, so that panel 4 Dragon can draw in a clean environment. That’s the shocking revelation of adulthood. Whatever it is that you do, you will most likely keep doing it. 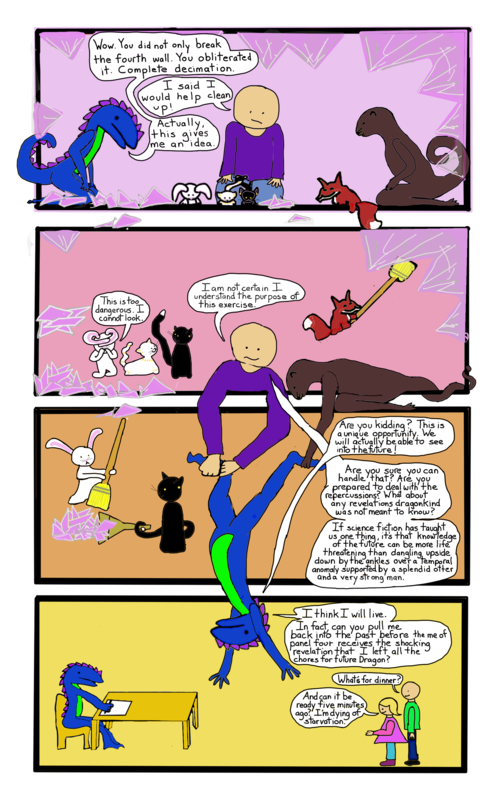 This entry was posted in Comics, Dragons and tagged 4th wall, cats, comics, dragon, fox, future, meta, otter, rabbit, self referential, time travel, webcomics on October 31, 2014 by littledragonblue. When I write that I am a private kind of person, I don’t mean it in the way that most people use the expression. I actually prefer to live my life in the open; shame and modesty are sort of foreign concepts to me, and it’s only my regard for others that prevents me from expressing myself in certain ways in public. I’m perfectly comfortable talking about subjects that are considered personal, things that make some folks blush just to imagine. In the past, I was more open, because I didn’t care who got offended. In the present, while my stepkids are still small at least, it seems prudent to keep certain things under wraps. In the future, I expect there will be fewer restraints, because there will be fewer reasons to self-censor. On that glorious day, my blog may become much, much more popular. Some people are horrified at the idea of sharing their lives on Facebook. Personally, as an artist, I think Facebook is an excellent tool. Here we are, struggling to express ourselves through art, trying to show the world some part of the interior. Facebook is perfect for artists. My life is my art, and Facebook lets me organize it most beautifully. What I am private about, though, are feelings. I can tell you what I’ve done all day long (and I’ve done a lot of things, many of which are experiences most people have not have), but, unless we’re very close, I’m not likely to tell you about anything but the most positive feelings. Self doubt, depression, and anger just aren’t on the table. Drawing the Dragon Comics has offered me a level of distance from emotions. 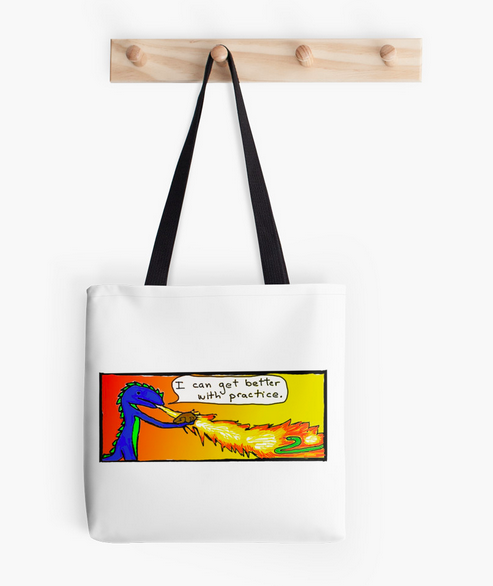 Thoughts that I wouldn’t admit to my best friend except in the most dire state of despair can come out of the dragon’s mouth, because, after all, the dragon is simply a cartoon character. Dragon can say anything. Catharsis appears to be an unexpected side effect of drawing comics. There’s not much to say about this mandala. I like the colors and the way the points curve as they taper. Can’t remember what was going on when I drew it but it exhibits a good sense of symmetry and precision. Tomorrow comic should be good, too. Today was the first time I just drew a panel and felt as if I knew what I was doing. I didn’t have to think about how to draw the characters’ bodies, or to Google images on which to base their postures. I just drew them. Here’s a tidbit…I’m a little nervous now, because up until this point, there’s always been some ideas in my mind as to where the comic was going, and with tomorrow’s comic, I’m completely caught up on the arcs that have been planned for all these weeks. Next week, Dragon and company will have to start doing something new. OK, maybe I have one or two ideas. 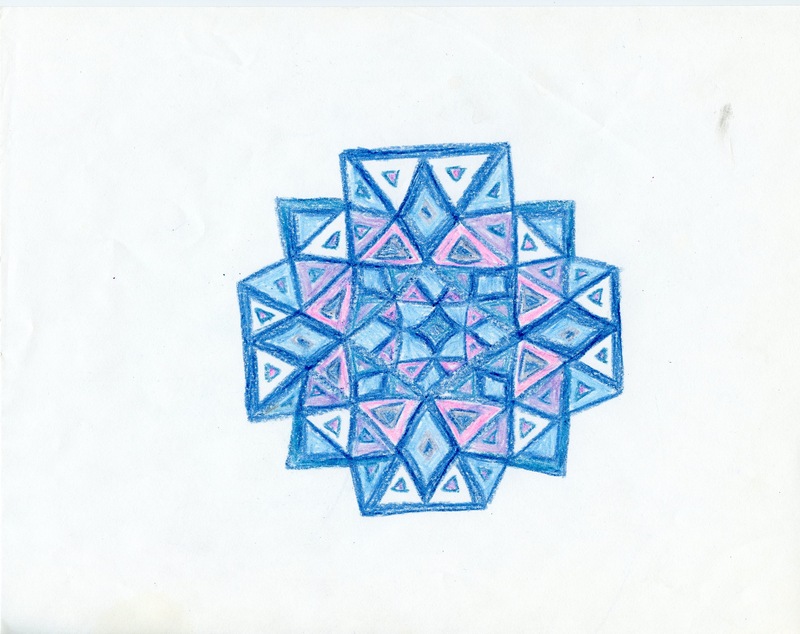 This entry was posted in mandalas and tagged emotion, feelings, privacy, private on October 30, 2014 by littledragonblue. Of all the work for hire I’ve done in my life, I’m perhaps most proud of the 30 entries I wrote for the Oxford Encyclopedia of Children’s Literature in the mid 2000s, including the entry on cartooning legend Tex Avery, whose 1949 cartoon short “Bad Luck Blackie” basically ushered the concept of cartoon violence into modernity. In retaliation for his torture of a kitten, a sadistic bulldog is cursed with bad luck, in the form of a variety of hilarious and increasingly unlikely objects that fall on his head whenever a black cat crosses his path. The first 2 items to fall on the dog’s head are flowerpots; these are city creatures, and flowerpots falling from windowsills are explainable, even if 2 in 1 minute strain plausibility. Then comes the steamer trunk, followed, of course, by a piano. There is some explanation for the falling bricks at a construction site, but little logic behind the live bomb and the now expected, if not completely unlikely, anvil. In the cartoon’s final moments, as the dog’s bad luck is sealed in seeming perpetuity, three final object fall from the sky onto his head as he runs off into a distance: a plane (OK), a bus (what? Did it fall off a bridge? ), and then, for the punchline, a ship. A large ocean liner falls out of the sky, onto the dog. His luck is indeed bad. That is the essence of cartoon logic. Anything can happen. But only when it’s funny. This is a lot of what I love about cartoons. Anything imaginable, as long as it’s funny. Peter does it in Family Guy and Pinky Pie does it in My Little Pony: Friendship Is Magic. And this is what Dragon is doing today. I love cartoons. I love drawing cartoons. It’s unlikely that I’ll get any worse at it. This strip gives me hope that I might be getting better. 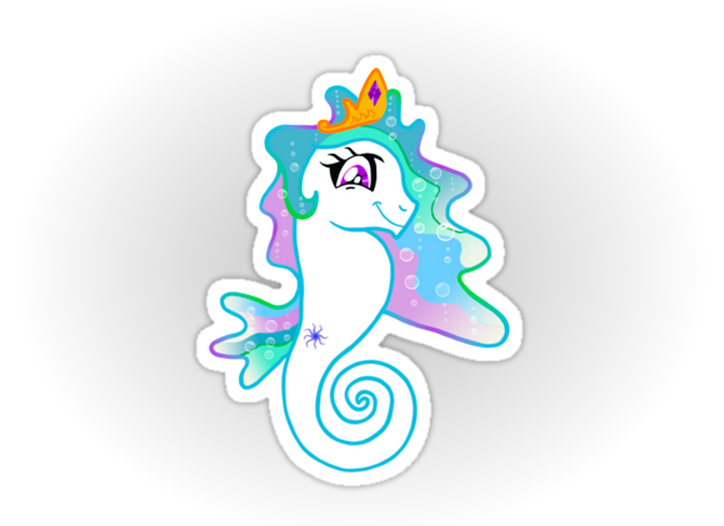 But I wanted to examine the Horsehead Nebula! And shoot the fun size trebuchet. And maybe eat a banana, or some other piece of fruit off the Carmen Miranda hat. 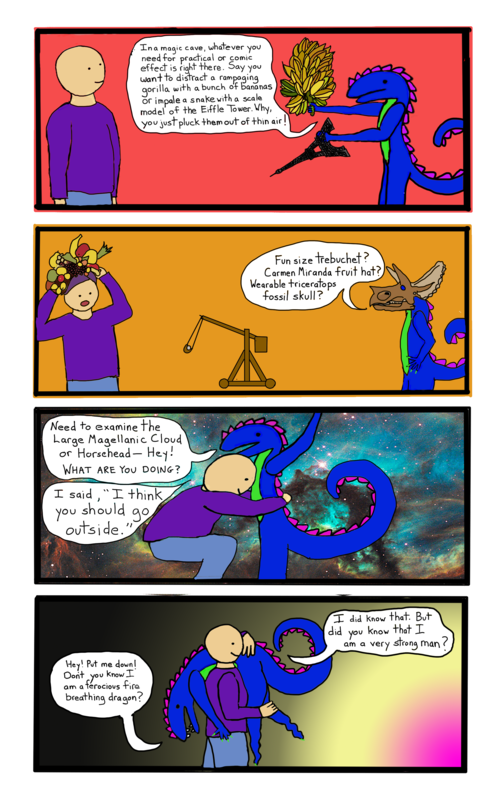 This entry was posted in Comics, Dragons and tagged carmen miranda hat, cartoon violence, comedy, comic, dragon, funny, large magellanic cloud, trebuchet, triceratops fossil skull, webcomic on October 24, 2014 by littledragonblue. Once I read a Navajo fairy tale in a picture book about a weaver who became some obsessed with perfection in her work that she became trapped in her own art, as if she sewed her soul into the design. Navajo weavers always leave a “way out,” some imperfection in their pattern, to prevent this spiritual entanglement, a fact of which I was reminded when we visited Tuba City in the Navajo Nation last week. This mandala also reminds me of that legend. The turquoise color and the shapes reflect some of the art we saw on our journey. Of course, I never have to worry about leaving myself a way out of my mandalas, since it’s been many years since I even imagined that perfection was possible in drawings. 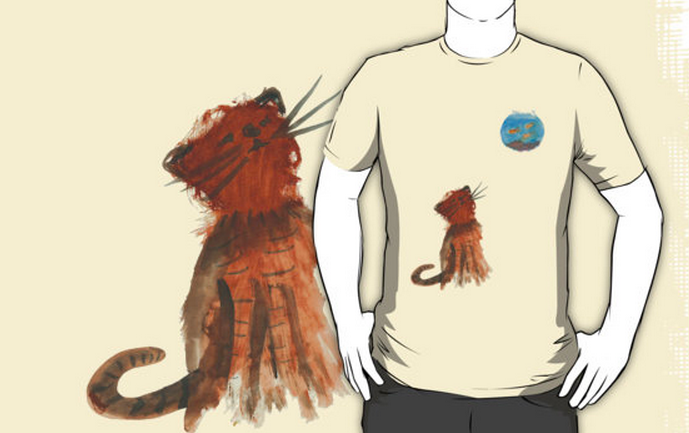 This one is pretty tight though, even if it skews a bit. 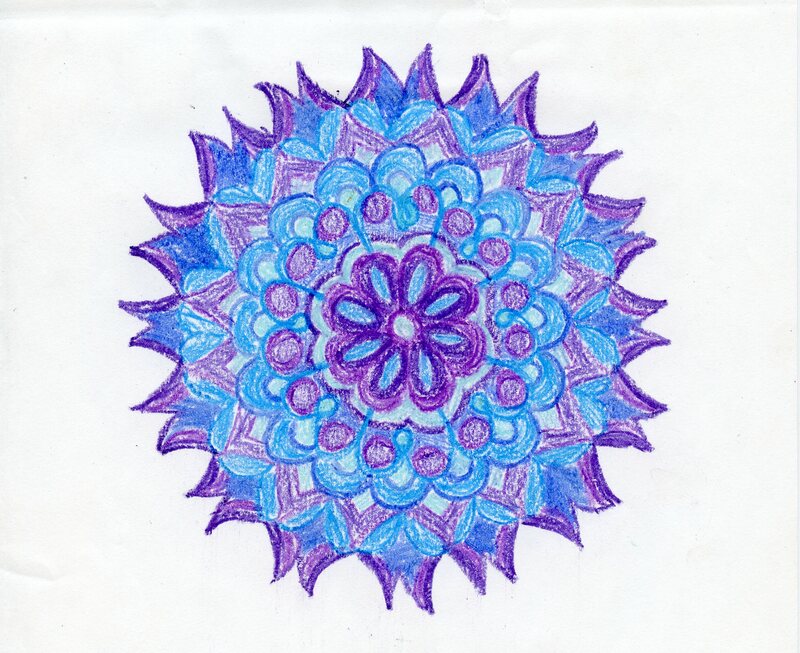 This entry was posted in mandalas and tagged crayon, fairy tale, imperfection, mandala, navajo, turquoise, weaving on October 23, 2014 by littledragonblue.